St. Urho’s Day is celebrated on March 16th, the day prior to the better known feast of some minor saint from Ireland, who was alleged to have driven the snakes from that island. The legend of St. Urho says he chased the grasshoppers out of ancient Finland, thus saving the grape crop and the jobs of Finnish vineyard workers. He did this by uttering the phrase: “Heinäsirkka, heinäsirkka, mene täältä hiiteen” (roughly translated: “Grasshopper, grasshopper, go to Hell!”). His feast is celebrated by wearing the colors Royal Purple and Nile Green. St. Urho is nearly always represented with grapes and grasshoppers as part of the picture. 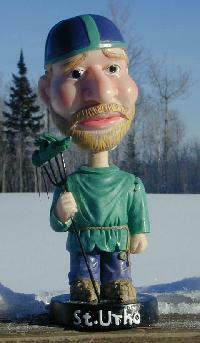 Our sincere thanks to Tim “Timo Winkenen” Winker and Randy “Uncle Toivo” Jokela for keeping St. Urho’s Day spirit alive and well.